"Bean soup is on the menu in the Senate's restaurant every day. There are several stories about the origin of that mandate, but none has been corroborated. According to one story, the Senate's bean soup tradition began early in the 20th-century at the request of Senator Fred Dubois of Idaho. We like his version because it contains mashed potatoes, of course!" Heat olive oil in stock pot over medium high heat. Add chopped onion, celery, and carrots and cook until they begin to to soften slightly. Add vegetable stock and ham bone. Bring to boil and reduce heat; simmer for an hour. Remove ham bone from pot and pick off ham; return meat to pot. Add the beans. Add package of Idahoan Roasted Garlic Flavored Mashed Potatoes and stir thoroughly. Mix in chopped parsley and adjust seasoning if necessary. Cook for an additional 5 minutes and serve. Discover time-saving tricks for making delicious tortilla soup. After reading the reviews, I was suprised at how bad this soup actually was. The texture, thickness and especially the taste was terrible. 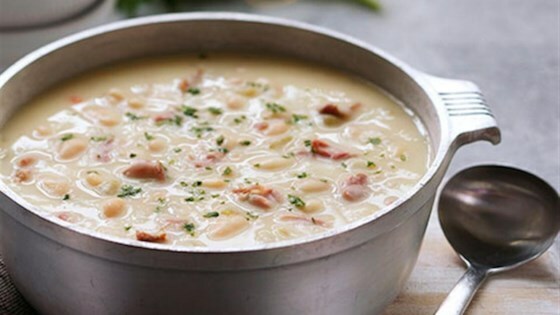 This is amazing soup, full of flavor and easy to make. I did not have the potato flakes so added garlic and frozen mashed potatoes from Trader Joe's. Otherwise, I followed the recipe exactly . Made as directed in the recipe. Really good. Will keep this one for more batches to use the ham bone leftover from holidays!